Metro 911 said a gas well exploded in Sissonville Tuesday afternoon and four structures were apparently on fire. A dispatcher said the fire apparently occurred in the 7000 block of Sissonville Drive. It happened about 1 p.m. The Kanawha County school system office reported that a shelter in place had been ordered at Sissonville Middle School and Sissonville Elementary School. A shelter in place also has been ordered at Cedar Ridge Nursing Home. Sissonville High School has been set up an area where people being evacuated can stay. The Pocatalico exit was apparently closed. Flynn Elementary was not affected. Eyewitness News Reporter Brandon Stover was in the Sissonville area, and he said the sound of the roar of the fire could clearly be heard. Flames and billowing smoke from the raging fire could be observed from a far distance away. " SISSONVILLE, W.Va. (WSAZ) -- According to Metro 911, people in the area are being asked to shelter in place after a major gas explosion has been reported in Sissonville. NGK Spark Plugs in Sissonville tells WSAZ.com that they are shutting down the plant for A and B shift. C shift is to report as scheduled. Emergency crews at the scene tell WSAZ.com that the gas line has been capped. Right now, the northbound lanes of I-77 are shut down at the I-77/79 split in Charleston. All traffic is being diverted to I-79N. Kanawha County Commission President Kent Carper tells WSAZ.com crews were called to what was described as a major gas line explosion in Sissonville. The fire was reported just before 1 p.m. along Teresa Lane in Sissonville. President Carper says fires have been reported in multiple locations. This explosion happened very close to Cedar Ridge Nursing Home, according to Carper. So far no injuries or fatalities have been reported. Drivers near the area say they can see flames shooting in the air. Rt. 21 will be limited to emergency vehicles. A spokesperson with Mountaineer Gas tells WSAZ.com the line is not theirs, but the company does have crews helping to assist in the area. "The flames are shooting 50, 75 to 100 feet. There's fire everywhere," said Carper reporting from the scene on 58-WCHS. "Gas company is on the scene working with emergency officials to get the gas shut off, then we'll assess if we have injuries or casualties. At this time it's a fairly chaotic scene." A gas line explosion rocked an area near Sissonville, W.Va., Tuesday, sparking multiple fires, burning several structures and melting part of the freeway, according to reports from the area. The Charleston Gazette reported that authorities were concerned about the possibility of another explosion and were making preparations to evacuated nearby residents. Sissonville is an unincorporated town about 10 miles north of Charleston with a population of just over 4,000. A major gas line has exploded in Sissonville, West Virginia, officials reported. Several structures in the area are on fire, Kanawha County Commission President Kent Carper said. Carper said it was "sounding like a jet engine" as the fire raged. "If you happen to be in the Omaha, Neb., area, take care and be mindful of the flames shooting up through the city's manholes. 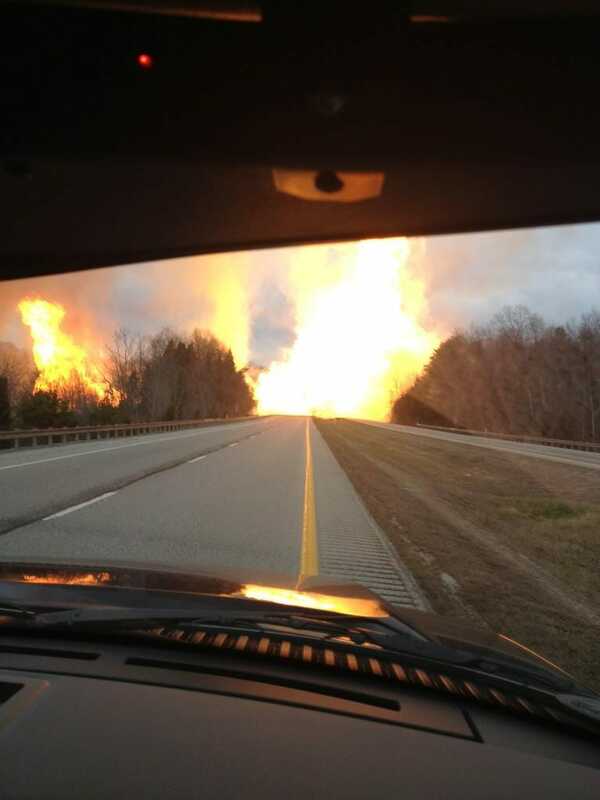 A sewer fire has caused power outages in one section of town and also created the perfect circumstances for dramatic pictures of fire erupting through from the ground up like hellfire as shown in the photo above. Omaha Public Power District Vice President Tim Burke speculates that because of past, unseasonably dry weather, a recent wet spell could have allowed moisture to get into cables and sparked the blaze." Wonder if that could have anything to do with these house fires...?? Damn winter and that 13 bean soup they make there. Do not,I repeat,do not throw your cigarette butts down the sewers!!! I went to college there. An early morning gas leak shut down a part of Forest Hill Avenue Thursday. Pressure from a gas main rupture was strong enough to make water bubble on Forest Hill Avenue early Thursday, an emergency that closed a city block and evacuated two homes. Shortly after 3:30 a.m., a strong smell of gas filled the air on the 5500 block of Forest Hill Avenue. Residents woke up to firefighters knocking on their doors three times, explaining a gas leak in the low explosive range threatened their homes. "They told us it was an urgent situation," said Justin-Mychal White, one of the residents evacuated. "The smell was potent, and you knew it was bad when they said the street bas bubbling." Firefighters shut down the area between Bliley Road and Westower Drive until 5:30 a.m. Richmond utility crews shut off the gas main, and the five evacuees were allowed back in their homes. It was not immediately clear what caused the incident. Wind gusts from Thursday morning's fast-moving storm helped to clear the air of the gas. Traffic is now open to Forest Hill Avenue, but two Richmond Utility trucks remain at the site to find the cause of the leak." Richmond, Indianapolis, Omaha, Hutchinson, Kansas, Bayou Corne, La.....I am going to keep track of all these gas "leak" related stories on this thread, if any of you hear about any others, please post.. Underground gas "bubbles" or "pockets" can expand for hundreds of miles. They no longer need a nuclear explosion to get a "Big Boom". Guess its a good think I quit smoking, now I use a E-cig and VAPE!! Fire and smoke rise at an upscale shopping district in Kansas City, Mo., where a city official said a gas explosion sparked a block-engulfing blaze, Feb. 19, 2013. One body was found in the debris and search-and-rescue teams were rushing to finish their work ahead of a winter storm that was expected to bring heavy snow. "KANSAS CITY, Mo. — A day after a natural gas explosion leveled a popular restaurant, investigators raced to search the rubble and tried to understand how the blast happened despite suspicions that flammable fuel had been leaking, maybe for weeks, somewhere in the busy outdoor shopping area. Hours before the explosion, witnesses reported a strong smell of gas, and firefighters were summoned to the scene at one point but left without ordering an evacuation. As the cleanup got under way Wednesday, search-and-rescue crews recovered a body, and the mayor worried that the debris could be concealing other victims. Mayor Sly James declined to say whether the body was that of a man or a woman, though authorities had been looking for a missing woman who worked at JJ's restaurant and had been seen there before the Tuesday evening blast. They previously said she was the only person still unaccounted for. A house exploded Wednesday evening on Cooper Avenue near Woodward Avenue and Normandy Road in Royal Oak, sending debris across the neighborhood and rocking nearby communities. It is unclear if anyone was in the house at the time or what injuries they may have suffered. The cause of the explosion is not yet confirmed. However, Local 4 has learned Consumers Energy was doing utility work earlier in the day on the street. The explosion appears to be caused by natural gas." "WGNO (h/t Anonymous tip): It happened just before 7 o’clock Tuesday evening about two miles from the C & M Marina. Authorities say a tug boat first caught fire, then the fire spread to the barge. WGNO: A tug boat is on fire after emergency reponders believe it struck a fuel line in Bayou Perot near Lafitte Harbor. [...] Jefferson Parish Councilman Chris Roberts tells WGNO News that the barge is on fire, and a representative from the U.S. Coast Guard says the fire is burning out of control. Associated Press: There was still liquid petroleum gas in the 19-mile pipeline and authorities were waiting for it to burn out, Coast Guard Petty Officer Alex Washington said. Associated Press, 2:45p ET: The Coast Guard says it will likely take until Thursday or later for a pipeline fire in Louisiana to burn itself out. Capt. Jonathan Burton said the barge was carrying 92,000 gallons of oil, but none was believed to be leaking. He said a sheen, which could be from diesel fuel, was spotted in Bayou Perot about 30 miles south of New Orleans. Four people aboard the tugboat were injured, one severely. Smoke rising from the site was visible Wednesday from downtown New Orleans." "Reuters) - No one was injured in an explosion and fire at a natural gas compressor station in rural Logan County, Oklahoma, late Thursday, the station's owner DCP Midstream LLC said on Friday. The blast occurred near Langston, about 45 miles north of Oklahoma City." "A central London resident has released video footage of the moment when a pavement exploded in central London, narrowly missing a passer by. The blast, which left a crater in the street, occurred at about 10:25 BST on Thursday and is thought to have been caused by a faulty power cable. Eyewitness Charlie Brook filmed the second explosion from her window. UK Power Networks said: "Safety is our top priority and the cause of this incident is being investigated." Ms Brook described hearing three explosions on Pimlico Road, the most dramatic being the second blast, which saw flames erupt into the air. "UPDATE – 8pm: Detroit officials say the fire is a diesel storage tank that is burning. Residents of the area have been forced to evacuate due to smoke and fumes. Detroit Firefighters are on scene at a refinery on South Fort Street in Southwest Detroit as black smoke raises above the west Windsor sky. Preliminary information indicates that explosions were heard followed by heavy black smoke. Detroit media is reporting that a tanker on site may have exploded. The fire is reportedly at the Marathon oil refinery. Winds are presently blowing from the southwest and smoke is not drifting into Windsor." "Melvindale Police tell 7 Action News an ALL CLEAR has been issued regarding the refinery fire evacuation. Residents may now return to their homes. A partial evacuation was put into place because Detroit firefighters say a tanker at the Marathon Refinery on Fort Street was on fire. Smoke could be seen for miles around and air quality concerns forced Melvindale city officials to evacuate residents near the fire. Firefighters had two trucks at the scene streaming water and two trucks streaming foam. Hazmat was also on the scene. Witnesses tell 7 Action News they felt the explosions from two blocks away. Stay with 7 Action News and WXYZ.com for updates throughout the evening. PRAGUE -- Prague's mayor says terrorism has been ruled out as the cause of a powerful explosion in the city center on April 29. Mayor Bohuslav Svoboda told reporters that the explosion was the result of a natural-gas leak that ignited. At least 35 people were injured in the blast, which occurred near the National Theater in the Czech capital, not far from the Vltava River, in a building that officials said sits between the Charles University's sociology faculty and the film and TV school of the Academy of Performing Arts (FAMU). Rescue workers said they were searching for three missing people who may still be buried beneath the rubble of the damaged building. But Svoboda said sniffer dogs were unable to find anyone." "A flash fire at Formosa Plastics in Calhoun County seriously injured at least 12 workers Thursday afternoon at the plant. Emergency officials from several agencies converged on the chemical plant, 102 Pease St., in Point Comfort about 2 p.m. after the fire ignited. Five of the wounded workers were transported to Citizens Medical Center in Victoria - four by ambulance and one by private vehicle - with varying injuries after the fire. Three are in the intensive care unit and listed in stable condition, and one was in serious condition was flown to Brooke Army Medical Center in San Antonio, said Shannon Spree, hospital spokeswoman. The fifth person was treated and released. Laurie Harvey, spokeswoman for Memorial Hospital in Port Lavaca, said the medical center treated seven people with minor injuries, such as smoke inhalation and minor burns. All have been released, she said. All of the injured brought in were decontaminated, she said, for any harmful chemicals they might have been exposed to during the fire." An oil tank has exploded in Louisiana in an area outside Baton Rouge, prompting the evacuation of 30 to 35 homes. The explosion happened late Thursday night near Denham Springs. No injuries had been reported early Friday. Belgian authorities on Saturday evacuated nearly 300 people from their homes after several cars of a train carrying chemicals derailed, causing a major fire near the city of Gent. The blaze led to a series of explosions in the railway cars prompting authorities to evacuate residents living near the site of the accident. "BLACK BETSY, W.Va. - Two men were injured this afternoon in a blast at the Airgas plant in Putnam County, according to officials on the scene. The men were taken to Cabell Huntington Hospital with first- and second-degree burns. According to a spokesman from Putnam County's emergency management office, an explosion and fire were reported at the Airgas Mid America plant on W.Va. 62 in Black Betsy at about 3:30 p.m.
Fifty cylinders of acetylene are believed to be the source of the explosion, emergency officials said. Acetylene is a gas commonly used for welding and torch-cutting metal." "NEW YORK (CBSNewYork) — Several manholes exploded in Brooklyn on Monday, setting cars on fire and sending people running for their safety. As CBS 2’s Alice Gainer reported, dozens of families were left without power following the explosions in Bushwick on Monday afternoon. As late as 9 p.m., power was still out for several customers, and smoke was still billowing on and off from one of the manholes that exploded. Not one, and not two, but three manhole covers blew along Menahan Street near Wyckoff Avenue, witnesses said. “I seen that there was smoke coming from out of there. So when I looked and saw that, that’s when I started telling people to get out; something’s going to blow,” Arlene Baker said." It blew up and hit the car under. At least he took his car out. That was the first one that blew up, and then the one over there, and then that one over here,” said witness Henry Alicen, pointing out the manholes." Authorities are reporting an explosion near Nellis Air Force Base. Early reports indicated a fire after a possible gas tank explosion at 4915 Sloan Lane. Firefighters and Las Vegas police were responding. It’s unclear if anyone was hurt. "Police were evacuating people Tuesday evening at Disneyland's Toontown after a report of an explosion that appeared to have involved dry ice, authorities said. No injuries were reported in the blast, which was called in about 5:30 p.m, Sgt. Robert Dunn of the Anaheim Police Department said. "As a precaution we have evacuated Toontown," Dunn told The Times. He said the dry ice appeared to have been placed in a plastic bottle. Officers on the scene were gathering evidence. A bomb squad from the Orange County Sheriff's Department was responding. No other details were immediately available. " So how many explosions, train wrecks, nuke plant disasters, broken bridges, etc., etc., before we believe something is wrong here in this country? 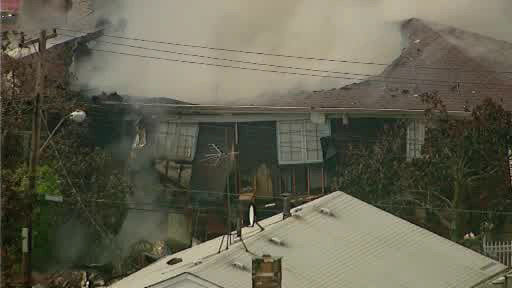 "HOWARD BEACH (WABC) -- Authorities are on the scene of a house explosion and fire in which a woman suffered critical injuries in Howard Beach, Queens. Word of the explosion and fire first came into Eyewitness News shortly before 2:00 p.m.
NewsCopter 7 showed heavy fire and smoke rising from the scene at 84th Street between 162nd and 163rd Avenue. Authorities sounded a second alarm around 2:20. Firefighters were being kept back from the building to fight the intense flames in case of another explosion."